PROVIDENCE, R.I. - The No. 9 Providence College women's hockey team fell to the University of New Hampshire by a score of 5-0 on Saturday, Jan. 19 at Schneider Arena. - The first period concluded in a scoreless tie. Madison Myers (Colchester, Vt.) turned away 13 shots, while Kyra Smith stopped all eight she faced for the Wildcats. - Sara Hjalmarsson (Bankeryd, Sweden) went to the box late in the period, giving UNH over a minute of power play time to open the second. Whitney Dove (Port Moody, British Columbia) then went to the box exactly 1:00 in, giving the Wildcats a short 5-on-3 opportunity. - The Friars killed off the two-man advantage, but Devan Taylor ended up converting for UNH on the power play. She scored a rebound goal after a shot from the point to make it 1-0 just 2:41 into the second. - The Wildcats extended their lead midway through the period. Taylor Wenczkowski and Marie-Jo Pelletier skated in on a 2-on-1, where Wenczkowski was eventually able to put home a rebound for the two-goal lead. - Providence had a power play late in the second period but was unable to convert. The Friars ended up outshooting the Wildcats 18-11 in the middle stanza. - UNH took a penalty early in the third, but ended up scoring a short-handed goal on a breakaway to make it 3-0. Meghara McManus scored her eighth goal of the season for UNH. - Nicole Dunbar made it 4-0 UNH with a diving play at the back post to poke in a rebound. Her goal, which was her sixth of the year, came at the 7:31 mark of the third. - Wenczkowski added an empty-net goal with less than three minutes to play. - Myers made 30 saves for the Friars, tying her season-high. 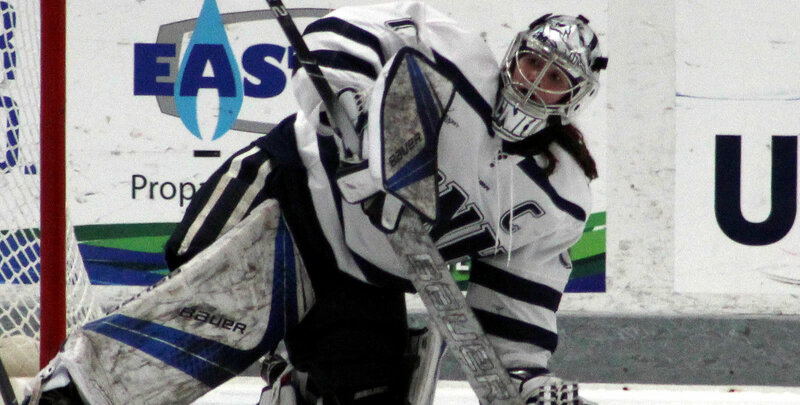 - Smith stopped all 41 shots she faced for UNH. That marked a career-high for the senior netminder. - Maureen Murphy (Buffalo, N.Y.) led Providence in shots on goal, as she tallied nine. - This was just the second game of the season in which the Friars were held off the scoreboard. Providence plays at Boston College on Friday, Jan. 25 at 2:00 p.m. and then hosts the Eagles at 3:00 p.m. on Saturday, Jan. 26.